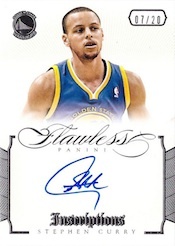 $1,250 -- that's the initial suggested retail price of 2012-13 Panini Flawless Basketball, a product that takes high-end to a new extreme. Once you get past the cost of entry, there is lots of potent content. Every box has ten cards including seven autographs and two jumbo memorabilia cards. 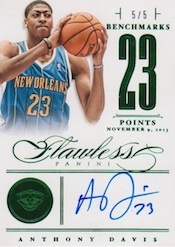 Every card in 2012-13 Panini Flawless Basketball is numbered to 25 or less. Base cards are numbered to 20 and are diamond-encrusted. 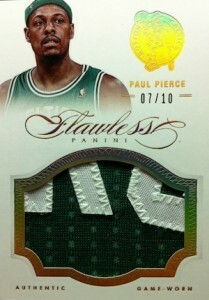 They also have a pair of parallels: Emerald (#/5) and Diamond Embedded (1/1). 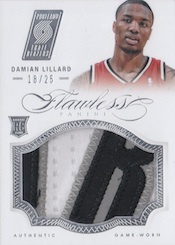 The set has the first on-card Damian Lillard autographs in an NBA product. 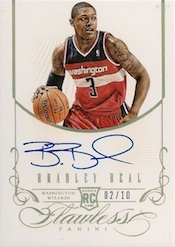 Although a Leaf exclusive, Panini was able to work out a deal with them to include the 2012-13 NBA Rookie of the Year. 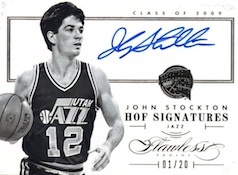 Besides Lillard, other signers for the set include Kobe Bryant, Kevin Durant Larry Bird, Kareem Abdul-Jabbar, Dennis Rodman, Kevin Love, Jason Kidd and David Robinson. Panini has a large gallery of samples posted on their blog. 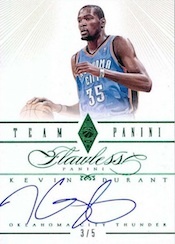 2012-13 Panini Flawless Basketball boxes come packaged in a custom briefcase. 2012-13 Panini Flawless Diamond Base Nerlens Noel RC #03 20!! 2012-13 Panini Flawless GOLD Logo Patch Dwight Howard #02 10!! A Super premium basketball product without LeBron and Jordan autos? I know, those guys are UD exclusive. For $1,250 I want Bird and Kareem to come to my house, play some hoops with my friends, and then take me out to dinner. I don’t possibly see the value in this product when Dennis Rodman is one of the main selling points. Wow. I’m not ready for that. Will the value really be there with no Jordan’s or Lebrons? If I was to get a Rodman signed card in my $1250 pack of cards I would tie a rock to it and throw it through Panini’s Corp window. For $1250 you should only get top players. Yeah can’t wait to pay 1300.00, and pull a rick fox, mark eaton, bill cartwright, cazzie russell, elvin hayes, and all those other veteran scrubs autographs!!!! 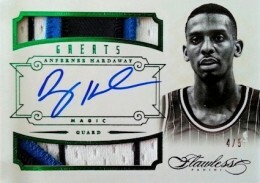 you are guaranteed a Kobe,Durant or Kyrie auto in every box. also if you happen to hit a Lillard auto you just hit the lotto. Best Product since 03/04 Exquisite! 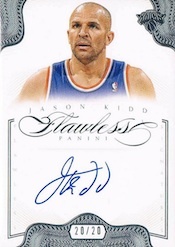 PANINI FLAWLESS IS NOT HIGH END, JUST HIGH PRICED! Yes, there are a lot of great cards and Panini seems to have done a great job, as well they should for what they are charging. However, bottom line is that it is still trying to be an “ultra high end” product with no Jordan or Lebron! By far the two biggest basketball names guys ever! Ultra high end does not work for a basketball product with no Lebron or MJ. 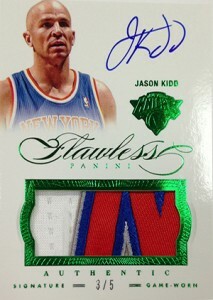 PANINI FLAWLESS IS NOT HIGH END, JUST HIGH PRICED! Agree with Greg’s comments. Way too expensive for the product (fmv $500-750/pack) without Lebron/MJ. 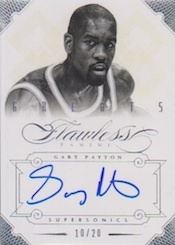 In addition, would’ve been nice to have more players and less parallels (especially on Greats auto/patches subset). Not even close to Exquisite! 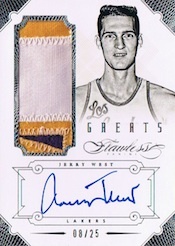 I’ve now officially decided to quit collecting basketball cards. And I’ve been collecting since 1975. Panini has too many so called high-end lines. They also saturate the market with similar products. Agreed if there are no Jordan or Lebron autos you can not consider it to be truly high end and does not justify the price tag. 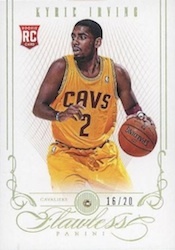 The cards do look good though and are highly collectable in the secondary markets. 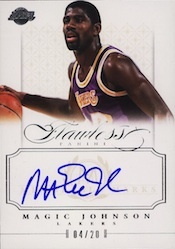 prices have nearly doubled soo..
5 – Nice beautifully understated basketball cards. On card signing. No duds in this deck. Just the best, no MJ and LBJ….No Chamberlain !!! 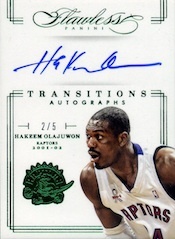 UD Equisites don’t look as nice…Deck appears to be above a normal looking basketball trading card. They look like a Memorial Placard. Most our very nice bust shots !. Forget “in action”. release of game worn patches of the rookies. Everything prior to was event or player worn. school variety of patches this year, this will be hard to top but I hope that Panini tries. Sweet base design. sick retired patches and nice rookie class.